This olive spread is legendary amongst my friends and family. 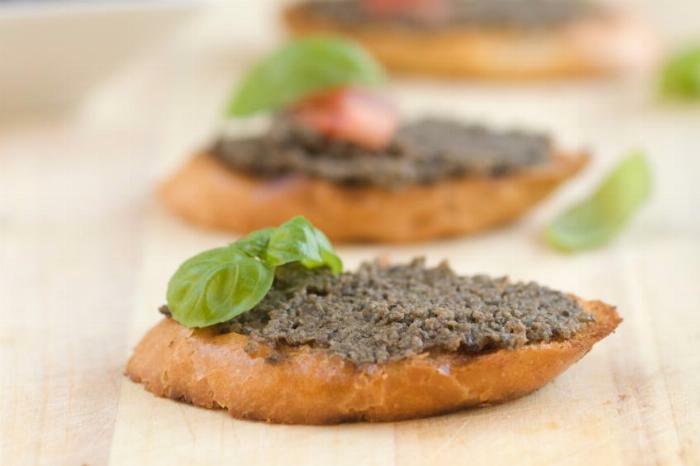 It is not a true "Olive Tapenade," because it's not made with a mixture of different olives or capers. Also, Tapenades are usually not made with cheese. However, if you like olives or Tapenades, you will love this. I have friends who claim they don't like olives, yet they love this spread. Serve with bread, crackers, or crostinis. 1In a food processor, pulse the pecans until roughly chopped. 2Add the Kalamata olives and garlic clove to the food processor and pulse again to mix the olives into the pecans. 3Add the goat cheese and olive oil to the food processor and purée until the mixture becomes creamy. You might have to stop and scrape the sides of the bowl with a spoon and mix again for another 30 seconds to thoroughly purée all of the ingredients. This recipe can be made and refrigerated a day in advance of serving. It will taste better if it sits in the fridge for 8 to 24 hours before serving.